Nurses have a central role in health education and promotion, particularly with regard to supporting individuals to optimise their nutritional intake and engage in healthy eating behaviours. However, high rates of obesity, unhealthy eating behaviours and low levels of physical activity have been found among nurses. Nursing is a challenging profession, and a high workload, a lack of resources and shift work may affect nurses’ ability to adopt healthy lifestyles. Supporting nurses to improve aspects of their eating behaviours, such as the nutritional value, timing and frequency of meals, can have a positive effect on their health which, in turn, may enhance their ability to care for patients. Although there is much literature available on the benefits of healthy eating, there is a lack of practical guidance for nurses on how to enhance their nutritional intake. 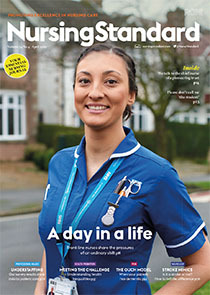 This article uses a case study to examine the occupational and personal factors that may affect nurses’ ability to engage in healthy eating behaviours, and identifies how healthcare organisations and individual nurses can use a behavioural change approach to optimise nutritional intake.